Where’d You Go, Bernadette? – Jenny and Jonathan Got Married! This isn’t actually a book report of “Where’d You Go, Bernadette?” Maria Semple published her novel in 2012. Goodreads and Amazon is already clogged with such reviews. However, the motion picture (with big name stars!) for this story (which actually takes place mostly in Seattle) is being filmed in Pittsburgh – and also New Kensington! The New Kensington filming actually happened in July. At the former Bloser’s Jewelers downtown. We were on vacation in Michigan during the whole thing. So, we didn’t see any movie stars. However, I wanted to share this photo that Jonathan took in 2009 of the actual building used for the New Kensington portion of the filming. I read “Where’d You Go, Bernadette?” this summer over two days of said vacation. I purchased my copy used on Amazon so that I could have a hardcover copy at the price of a paperback. I mention this because the fictional Bernadette in this story is an architectural pioneer for her work in material reuse. Spoiler alert: Bernadette and her future husband start off living in a glasses factory that she repurposed. She then pours her soul into constructing a house in California made entirely of used material sourced within a 20 mile radius from said house. She calls it the Twenty Mile House. Then everything goes to crap. She gets into a feud with her California neighbor. Her California neighbor sabotages the Twenty Mile House. Destroys it. Bernadette gives up on the whole architect thing. Just walks away from her career. Bernadette and her husband buy and move into a run-down, former convent home for unwed mothers in Seattle. Bernadette is supposed to renovate it. However, life slaps Bernadette in the fact, again and again and again. No work actually gets done on the convent house. Instead, Bernadette just ticks the Seattle neighbors off with the condition of her house and yard. There are a lot of other much deeper issues in the story. Just about everything that could go wrong in one life does actually go wrong. This is book is supposed to be a comedy, even though it’s pretty dark. Deep down, though, “Where’d You Go, Bernadette?” is basically a story about recycling. About taking something old and rejected (still of quality material), and trying to iron out all of the wrinkles, and fix it up as new. As better than new. It’s interesting that a story with such a strong theme of building reuse was filmed partially in downtown New Kensington. I didn’t actually like most of the characters in “Where’d You Go, Bernadette?” I hated Bernadette herself. But now I want to see this movie when it premiers next spring. 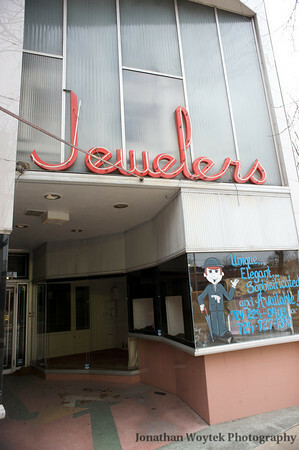 I want to see how the old Bloser’s Jewelers is reused for this project. I keep thinking about how Bernadette stuck her neck out at the beginning, then got burned. After she gave up and climbed under a rock and just wanted to be left alone, all of the women in her circle judged her. So she just cannot win. Just like high school. Just like every woman’s life after high school. And then I think about all of the gifted creative women that I ever met who stuck out their necks and how I judged – no, RESENTED – them for it. The women who had the cojones to ask for things when I didn’t. The women who blogged about subjects that I will never, ever touch. So even though I will never touch many subjects in this blog, I want to be truer to myself about the subjects on which I do blog. Finally, here’s the link to the New Kensington Corridor of Innovation Art and Music Festival. The festival is this Saturday, September 16.